A life without limits is a life well lived! – We’re all butterflies we all fly in our own uniqueness! Disability doesn’t have to be a limitation, it can and will be a strength! This is not a regular blog post, just wanted to wish everyone who celebrates Easter a Happy Easter. Let this be a time for new beginnings I hope it gives you all the courage and the strength to go after your dreams whatever they are! Remember to embrace your uniqueness and believe in yourself, You can do it! I always wish that this time of year brings lots of happiness, love and joy to you all and to all your family and friends! Next regular post will be up by the 3rd May! Recently I have been doing work with an internet radio station, in West Yorkshire (England) there is a radio show called This is us! It is a show made for and presented by people with disabilities! The show was created as a small group of people with disabilities who thought it was about time they took control and make people without disabilities pay attention. As a disabled person myself I think this is a brilliant idea! The show has done a lot of work in the community to make a difference for people with disabilities. They have covered a lot of topics that are not really discussed in public. The show also helps disabled people who are doing things to raise awareness an audience in order to promote their work. They are planning on getting professionals on the show so that they can listen to what disabled people have to say! Services like these are a great step forward to becoming an even better all inclusive world for everyone! I think projects like this are wonderful for disabled people and getting their views an opinions heard. It’s great and long may it continue! I was lucky enough to be interviewed by such talented people about this blog! If you wish to listen to This is Us click on the link below. There is more shows on http://www.mixcloud.com and South Leeds Radio! Me and My Blog! Questions Answered! I recently did a internet radio interview about this blog and the reasons why I write! I thought it would be a good idea to answer some of the same questions and a few new ones as a post to give you my wonderful readers a better insight into my life and the reasons why I started writing this blog. 2. What is your background in terms of Education? 3. When did you start writing the blog? I started writing this blog in late September 2018. 4. What is the blog about? The blog is about being disabled and all the ups and downs that come with having a disability. I am using my personal experiences and knowledge as a disabled person to try and inform, inspire and reassure people. One of my main purposes of writing a blog is to try and make people aware that just because of a disability you don’t have to let it define you or let the limitations control you, instead embrace your disability and turn it into a strength to achieve anything you want to, everything can be overcome and nothing is impossible! 5. Who is the blog aimed at? The blog is aimed at everyone, but particularly people with disabilities and their families. It is also aimed at parents that have recently been told that their baby/infant has a disability and are upset about the diagnoses and that a worried sick about the future for their child seeking reassurance or advice or just simply just to know they are not alone. It is also aimed at people that are just curious and wanting to find out more. 6. How did you come up with with the name Brightsidebecs? My friend who has been a big support to me in my life and getting the blog up and running helped me with the name. Becs is a nickname for my actual name and I wanted something that sounded positive as I want my blog to be mainly positive about disability. I also wanted something that people were going to remember! 7. What do you want to achieve from your blog? As I said in a previous question I want to inspire and reassure people and it would be nice to continue to spread a positive message on disability. Just to know I have helped someone feel a little better about themselves or their future even if its just for a few seconds it’s all worth it! I’d like to think that my blog will empower people to believe in themselves to follow their dreams. 8 You mention your parents in your blog, how have they supported you? My parents have made me the determined personI am today, they have brought me up as able bodied they have not treated me any different just because I am disabled. They have taught me that my disability is only a small part of who I am and that I can achieve anything and handle whatever life throws at me. They support me in everything I do! 9. What’s your personal plans for the future? My personal plans for the future are to live independently, I am currently in the process of applying to do a councelling course, to hopefully one day become a self employed consellor. I would also be open to starting a family sometime in the future! All of which I will blog about along the way! I would also love to do a skydive! I love to spend time with friends and family, I love to socialise and meeting new people. I also love to push myself and my disability to the limits! I love travelling and expirencing and learning new things. I go to a lot of live music and theatre. I also do a few things for charity. For example I have participated in a colour run for charity in my wheelchair. 11. In one of your most recent blog posts, you spoke about your personal expirences of been disabled. What was the purpose of this? What are you hoping/wanting the reaction to be on this post? I wrote this particular post because I have been wondering for a while if disabled people, (myself included) if we would get treated better with more respect and value if able bodied people knew what it was geniuinging like for a disabled person every day. I was as brutally honest as I could be, and I am going to continue with “my version” of disability in the future. As I couldn’t fit it all into one post and i think it is important ant for me to write about to raise awareness! We are all unique and human beings! The reaction that I am hoping to get/wanting is what I have just mentioned that everyone sees us as just like everybody else because we are! 12. What is the the future of your blog? As I keep mentioning I want to continue to inspire and empower disabled people. I am going to hopefully start a YouTube channel in the near future which will coincide with this blog. I would also like to work along side disabled organisations to continue to inspire and hopefully make a difference! if people are interested and want to know more listen to the internet radio interview that I did, I will put the link up on my social media platforms when it becomes available at the beginning of April! 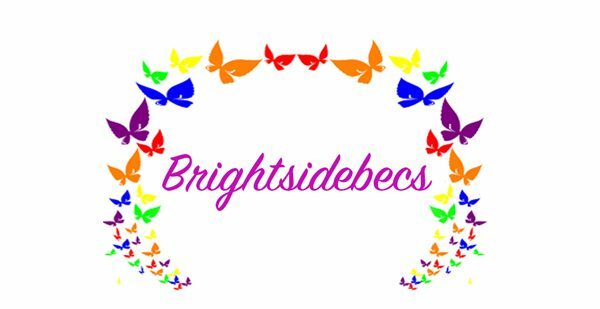 all my social media platforms have the same name as my web address for this blog : brightsidebecs, I have Instagram, Twitter and a Facebook page! My Twitter name is Brightsidebex. I often think to myself if people really knew what was going on in a disabled persons head, would we get treated better? Let’s find out the answer to the question by me been fully open about my thoughts and feelings about being disabled. I must state before I begin this account of being disabled, it is important to note these are my own views and opinions. They are my own personal feelings and experiences. I am defiantly not speaking for all disabled people and saying we all feel like this because I am not! I’m sure there might be similarities but everyone is unique and experience things differently! Now I have that out the way here goes some of the things I have never said out loud to anyone! How does it feel to be disabled? Well if people were giving it away for free I wouldn’t be queuing up to get it that’s for sure! I can’t really remember struggling with it when I was younger as I was born with my disability, Cerebral Palsy. My parents say I did struggle and get upset about it but as a child I think I must of known that I was different because of my wheelchair but not understanding why. I asked my parents questions like “why can’t I run around like the other kids? I never missed out on anything, my parents made sure of that! I had a very ‘normal’ childhood. It’s when I became a teenager and into adulthood that I fully realised what the word ‘disabled’ really meant. As a disabled person a lot of the time I feel like I’m in competition with society, if society says I cant then I show them I can. To get a better understanding of what it physically feels like to be disabled I am going to tell you something someone once said to me, (again its not any proven statistics or reaseach its just information that I got told so that I’d understand my disability better) someone who had a disability requires their brain and body to work three times as hard to do simple tasks then the average able bodied person! People really don’t realise how lucky they are to be able to just do a simple thing like walking up a step or being able to make yourself a sandwich without a risk assessments being carried out first. I will go into the joys of them beauties in a later post. I often feel very frustrated that people seem to class me because of my wheelchair as a second class citizen, I often don’t feel valued as a person because I spend most of my day feeling invisible as people are stepping over me or falling over me as they are so wrapped up in their own lives to notice. Due to my disability I have to rely on other people constantly to help me do everyday tasks. I have wonderful people to help me with this but sometimes I just would love to be able to do it all myself as in my head I feel able bodied and my body is disabled so you can imagine the conversations I have in my head with myself right? I often feel attached to an old lady’s body as it feels like my body doesn’t want to do what my head is saying. I hate relying on people when in my head I’m quite capable of doing everything myself. Being disabled is just a series of battles between yourself and parents the government professionals and society and its exhausting. Simple day trips and holidays take sometimes months to plan because all the provisions that need to be put in place to make sure your needs are met. It also angers me that disabled people also seem an afterthought or the last on the list of priorities when new buildings are been built. We are just as important as everyone else. Being disabled means I always feel like I am always putting each other’s feelings before my own and I just wish I could scream and say it’s my life not yours, I’m doing this. If I had the chance to redo certain things it would be my choices and I’ll be really happy. This post will continue at a later date as I could go on and on about my feelings. Would I change being disabled If I had the opportunity? Yes, in a heartbeat however, being disabled isn’t all bad and I have a wonderful life! Remember being disabled doesn’t stop you from doing anything and nothing is impossible. Also look on the Brightside! Since it is Valentine’s Day this week I thought I would just write a quick post! Happy Valentines Day to all that celebrate it! Pour the love and support into everyone! Sprinkle a little bit of kindness wherever possible, even a smile to someone could brighten up their day! To people having a hard time at the moment it’s ok and things will get better even if it feels impossible right now things will be brighter sooner then you think! To everyone that is really happy at the moment remember to enjoy every second because you deserve it! Remember that it’s the little moments in life that are the most precious and priceless! Poor the love and kindest everyday not just on Valentine’s Day! Pour the love by taking a second to appreciate the little things in your life and most importantly your family and friends! Life and everyday stresses can get in the way so just remember you are loved and appreciated! I would like to say thanks and love you to all my family and friends! To someone very special I would like to say I love and miss you very much, you know who you are! As I have mentioned in my previous blogs, people are quick to stereotype, one of the major stereotypes that’s so absurd in my view, is that people with disabilities can’t have what’s considered as a ‘Normal love life’and that we can’t have a family of our own! Of course this is completely incorrect. Disabled people are exactly the same as any other human being on earth! We have the same desires and dreams. From my personal experience being in love is one of the best feelings in the world, being in love with someone who is also your best friend is incredible! Which I proudly can say has happened to me! Being in a disabled relationship is not much different to the average ‘able bodied’ relationship in terms of dating and all the ups and downs that dating entails , for example finding time for each other with very busy schedules, and of course the arguments! Right? One of the major challenging factors or difference if you want to do what I hate and compare! Is that when your in a ‘disabled relationship’ people don’t take you as seriously as people that are in ‘ordinary ‘ relationship, which in my personal opinion is just closed mindfulness as it does not matter if you are in a wheelchair or not love is love no matter what the circumstances or what is considered ‘normal’ within society. There is no such thing as Normal! Another issue that can be a problem when you are in a disabled relationship is that people tend to have an opinion more often on your relationship as you don’t have much privacy due to the extra support that is sometimes required, so for instance an argument is sometimes over heard and as a couple you may of forgiven each other but for other people their opinions have accidentally formed and that is sometimes hard to change, this can of course cause conflict in any relationship but can be made worse when you are disabled! Everything just needs more planning and discussions when deciding to progress the future of the relationship in terms of living together and family planning etc. I assure you it is all worth it! All that is required is the relevant support, care plans/ packages are up to date and that the correct provisions are put in place so that you can continue living the life you want to live! Nothing is impossible! If I had the chance with a very special someone once more, I would love nothing more then to break down the barriers that got in our way which can of course be done and have an incredible future together! Anyone in love or has been in love in the past will know there is absolutely nothing you wouldn’t do to be with the person you love! Unfortunately however I didn’t act on my own advice and things didn’t go the way we both intended! The rules do not change just because you are disabled! There is no guide book to love, every relationship whether you are disabled or not is hard at times and no relationship is the same! Just follow your heart, take that leap of faith because it’s better to have a go then be scared of something that might be the best thing you have ever done, like I said love is love whatever the circumstances or conditions!